It may seem kind of silly to review a system from 2004 that is no longer being produced, but I think it is worthwhile as a base of comparison to the newer units. I was able to purchase my Flashback 1 for less than $10 and it came complete with the base unit, power supply, two controllers, box, and a manual. Having only seen pictures of these until this unit arrived, I was surprised at how small it is. The Flashback 1 looks like a miniature Atari 7800 and is about half the size of the subsequent Flashback units. At first I thought it would be cool to see how the five 7800 games translated, but I was soon disappointed. Centipede isn’t too bad but Asteroids didn’t make the transition well at all. Also, I find the 7800 game selection puzzling…Asteroids, Centipede, and Food Fight are popular titles, but Desert Falcon and Planet Smashers are less well known. In fact, Planet Smashers is one of the rarer 7800 titles and, also, one of the poorest rated. Given the quality of the 7800 ports, I am not sure that it would have mattered, but Dig Dug, Ms. Pac-man, or Pole Position II would have been better choices. I am happy to say that the 2600 ports are much better. Of course, more effort has been put in over the years to port and emulate the 2600, so I guess that this should have been expected. The exception is Battlezone…this port is horrible and hardly worth playing. Millipede, on the other hand, is a blast to play on the Flashback. Also, the Flashback 1 introduced the concept of releasing prototype games and included the previously unreleased Saboteur. Breakout and Warlords had to be modified to use the Flashback joysticks and I wasn’t expecting much. These were a pleasant surprise and are very playable. It should be noted that the Flashback 1 joysticks are not usable with standard Atari (or other Flashback units) as they are wired differently. Given that we know that the Flashback 1 was a ‘rushed’ effort, I guess it would be a cliche to say that it seems half polished. Unless you are an Atari collector and need to have one of these, I would recommend skipping the Flashback 1 in favor of a Flashback 2, 2+, or the newer Flashback 4. The Flashback 1 is an important piece of Atari history in that it marked the return of Atari to the console market. 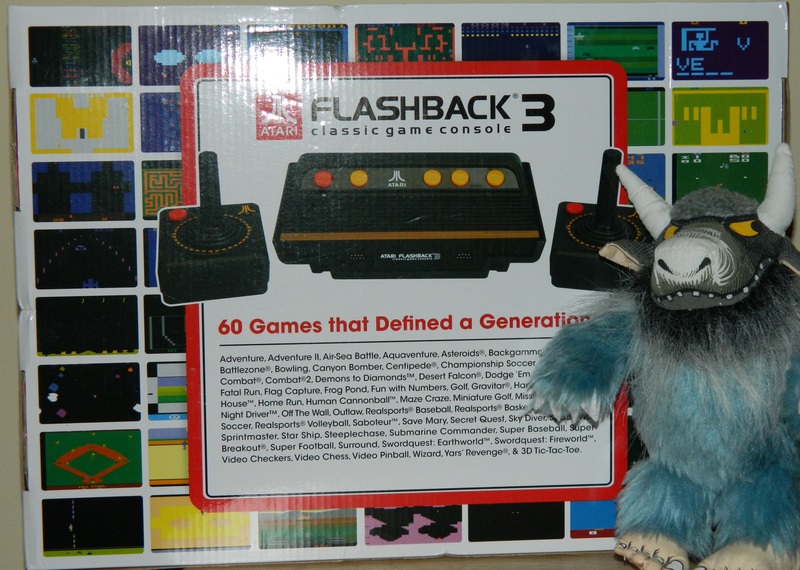 It also sold well enough to convince Atari to proceed with the Flashback 2. As I will discuss in a future post, the Flashback 2 is the system that Curt really wanted to build in the first place. Speaking of Curt, he is going to have a significant surgery this week and I want to wish him the best of luck and a speedy recovery! Categories: 2600, 7800, Atari, System Reviews | Tags: 2600, 7800, Atari, Flashback, game, retro, VCS | Permalink. To date, there have been five Atari Flashback models. In this post, I will give the general background on these units and go into more detail in future posts. The Atari Flashback 1 met with mixed reviews, primarily due to the emulation. Also, Breakout and Warlords had to be modified to use the Flashback joysticks. The system was however, successful enough to convince Atari to proceed to with the Flashback 2. 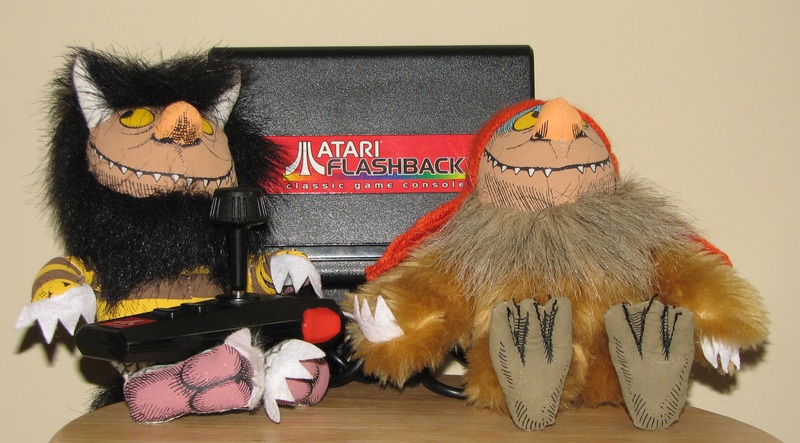 In 2005, Atari again turned to Curt to develop the Flashback 2. This time around, the system would include 2600 games only. With more time for development, Curt designed a custom chip to produce an ‘Atari 2600 on a chip’. Curt also included provisions on the motherboard for adding a cartridge slot. A modified Flashback 2 can play most games designed for the 2600. Taking a page from the Atari playbook, the name for the Flashback 2 project was ‘Michelle’ for Curt’s wife. Her name is printed on the Flashback 2 motherboards. The Flashback 2 looks like a small Atari 2600 and has two joysticks that are compatible with the original 2600 and, also, supports the use of original Atari paddle controllers. Arcade Favorites: Arcade Asteroids, Arcade Pong, Asteroids Deluxe, Battlezone, Centipede, Lunar Lander, Millipede, Missile Command, and Space Dual. The Flashback 2 broke new ground as it included homebrews, hacks, unreleased prototypes, and two Activision games. With a great game selection, new 2600 hardware, and the ability to add a cartridge slot, the Flashback 2 was popular with both the general public and the Atari community and sold almost one million units. 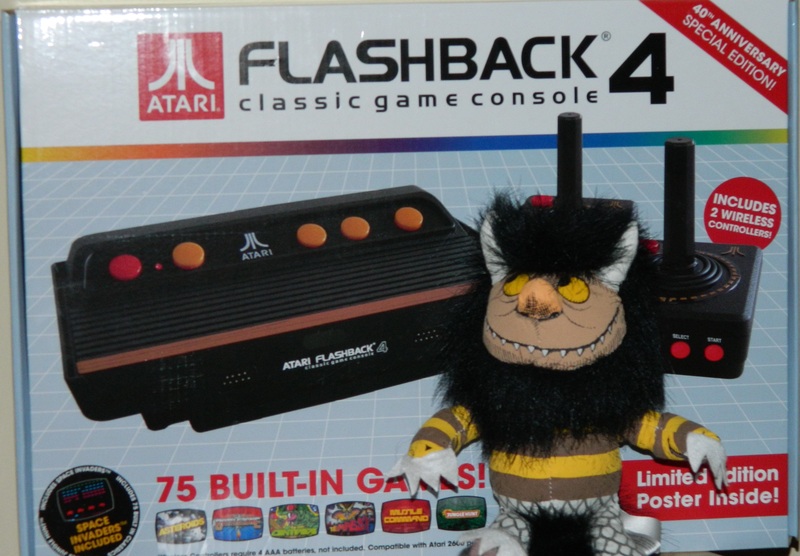 Released by Atari in 2010, the Flashback 2+ is, essentially, the same as the Flashback 2. 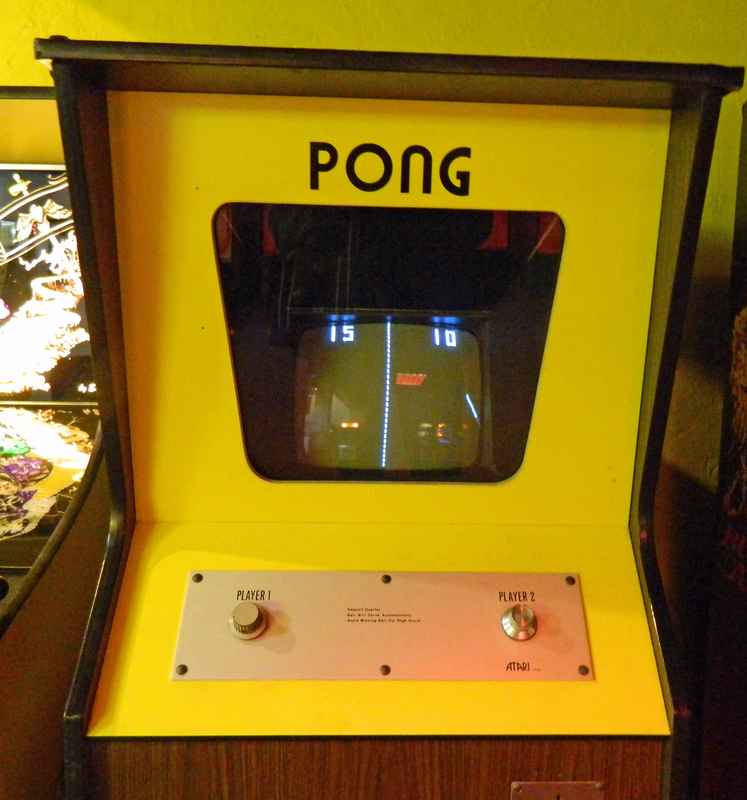 Atari Climber, Caverns of Mars, Pitfall!, River Raid, and Wizard were removed from the game selection and a sports section was added that included: Realsports Boxing, Realsports Soccer, Super Baseball, Super Football, and Double Dunk. Also, Circus Atari was added to the ‘hidden’ section for a total of forty three games. For 2011, Atari licensed out the Flashback concept to AtGames. AtGames developed the Flashback 3 around an ARM processor and included sixty games. They originally did not include Curt in the design, but ended up bringing him in as a consultant when they ran into some technical issues. The Flashback 3 included two joysticks that are compatible with original Atari systems. 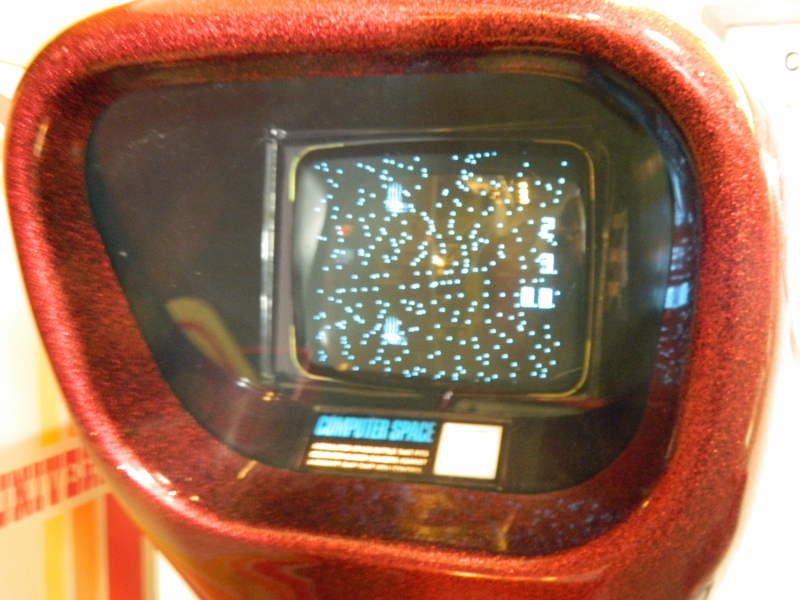 Games included on the Flashback 3: 3D Tic-Tac-Toe, Adventure, Adventure II, Air-Sea Battle, Aquaventure, Asteroids, Backgammon, Basketball, Battlezone, Bowling, Canyon Bomber, Centipede, Championship, Soccer, Circus Atari, Combat, Combat 2, Demons to Diamonds, Desert Falcon, Dodge ‘Em, Double Dunk, Fatal Run, Flag Capture, Frog Pond, Fun with Numbers, Golf, Gravitar, Hangman, Home Run, Haunted House, Human Cannonball, Maze Craze, Minature Golf, Missile Command, Night Driver, Off the Wall, Outlaw, Realsports Baseball, Realsports Basketball, Realsports Soccer, Realsports Volleyball, Saboteur, Save Mary, Secret Quest, Sky Diver, Space War, Sprintmaster, Star Ship, Steeplechase, Submarine Commander, Super Baseball, Super Breakout, Super Football, Surround, Swordquest: Earthworld, Swordquest: Fireworld, Video Checkers, Video Chess, Video Pinball, Wizard, and Yars’ Revenge. AtGames released the Flashback 4 in late 2012 with several improvements over the previous model. It features new wireless controllers, support for paddles, and improved emulation. It also includes seventy five games. Secret Quest was removed from the game selection and sixteen games that were added. The added games over the Flashback 3 are: Black Jack, Breakout, Crystal Castles, Football, Front Line, Jungle Hunt, Polaris, Pong (Video Olympics), Return to Haunted House, Slot Machine, Slot Racers, Stellar Track, Street Racer, Space Invaders (special FB 4 edition, not 2600 version), Tempest, and Warlords. Read more about the Flashback 4 in my previous posts. Categories: 2600, 7800, Atari | Tags: 2600, Atari, Flashback, game, retro, VCS | Permalink. An Atari Flashback 3 or 4? I purchased my Flashback 3 (FB 3) at a local retailer last year and, as of today, they still have these for sale for under $30. The FB 3 comes with 60 built in games and two wired joysticks. These joysticks have a softer feel than the original Atari CX-40’s, but have become my favorite for playing ‘one button’ games on my 7800. In fact, the main reason that I purchased a FB 3 was to get a set of these joysticks. As for the game selection on the FB 3, there are several classic games, including: Asteroids, Battlezone, Centipede, Circus Atari, Gravitar, Missile Command, Video Pinball, and Yar’s Revenge. It also includes several ‘prototype’ games not originally released by Atari: Combat 2, Frog Pond, Saboteur, and Save Mary. Wild for the FB 3! I paid $40 for my Flashback 4 (FB4) the first week that it was available. These were on sale for under $30 just before the holidays at a couple of stores in my area. They are still available at several on-line merchants for between $40-50. The FB 4 includes 75 games versus 60 on the FB 3. The additional games are: Black Jack, Breakout, Crystal Castles, Football, Front Line, Jungle Hunt, Polaris, Pong (Video Olympics), Return to Haunted House, Slot Machine, Slot Racers, Stellar Track, Street Racer, Space Invaders (special FB 4 edition, not 2600 version), Tempest, and Warlords. I am not sure why, but one game that was included on the FB3, but not on the FB 4 was Secret Quest. The addition of Front Line, Jungle Hunt, Pong, Space Invaders, and Warlords justify the purchase of the FB 4 instead of the FB 3, but there are also a few other reasons to consider the FB 4. First, the FB 4 has wireless joysticks. Although they are IR based, they work well and it is really nice to be able to sit across the room and be able to reset or change games. The second reason to consider the FB4 is the ability to use paddle controllers. Have you ever tried to play Super Breakout or Warlords with a joystick? Third, the emulation is improved versus the FB 3. It wasn’t too bad on the FB 3, but the emulation is ‘pretty darn good’ on the FB 4. Wild for the FB 4! Given the fifteen additional games, the ability to use paddles, and the wireless controllers, I would give the FB 4 a solid recommendation over the FB 3. If you need some replacement joysticks for your classic Atari 2600 or 7800 and can find one for under $30, the FB 3 is still a great buy. There is also a ‘Deluxe Edition’ of the FB 4 available for around $80. For the extra $40, you get a set of paddle controllers and four additional posters. If you can find one of these on sale for under $60, I would say that it would be worth the extra $$$ to get a set of paddles. If you enjoy classic Atari 2600 games, both systems represent excellent value. With that being said, the FB 4 gets my recommendation as a better system and a better value. Categories: 2600, Atari, System Reviews | Tags: Atari, Flashback, game, retro | Permalink. On US Route 3, just a short drive north of the Weirs Beach Boardwalk, Funspot was founded by Bob Lawton in 1952. Funspot has been in its current location since 1964 and, in 2008, the Guinness Book of Records named Funspot the ‘World’s Largest Arcade’. In addition to all of its arcade systems, Funspot is home to a nine hole miniature golf course, a ten lane bowling alley, a tavern, and a restaurant. Most importantly, the third floor houses the ‘American Classic Arcade Museum’ and is a true 8-bit retro gamers dream come true. Funspot is a good two hour drive from my home, but what better to do on a sunny, but cold January day in New Hampshire? Although I play my Atari game systems as much as I can, it had been a long time since I had been to an arcade with so many 8-bit systems. As I entered the third floor of Funspot, I was amazed at their collection of systems. It didn’t take me long to exchange some dollars for a cup full of tokens. The biggest question was where to start? 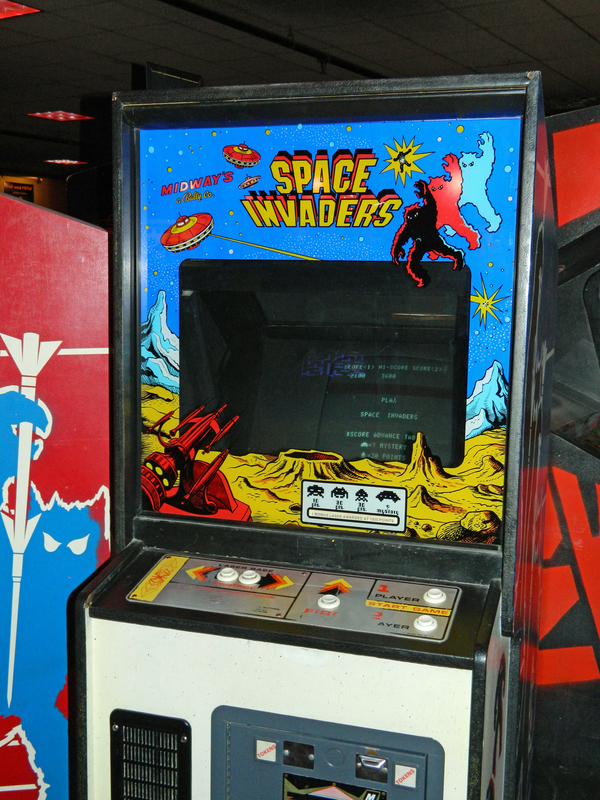 I ended up starting with an old favorite…Space Invaders. For not playing the arcade version for so many years, I was pretty happy with how I did. In two or three hours, I managed to play the following games: Berzerk, Centipede, Crossbow, Defender, Donkey Kong, Missile Command, Pac-Man Plus, Jr. Pac-Man, Space Invaders, Super Cobra, Zaxxon, and many others. It was a total blast and, on some games I did well, but others were a real challenge. You get so used to playing with your joysticks at home, that some of these games are a real adjustment. I was completely useless on Defender and just could not manage the hand-eye coordination required for the arcade version. What was really fun was to see how well many of these games translate to the Atari 2600 and, especially, the 7800. When I write about games, I always take a look at photos and videos of real arcade systems, but nothing beats being able to play the real thing! If you are reading this blog, then you enjoy retro gaming. If you happen to travel to or live in New England, you owe it to yourself to add a visit to Funspot to your itinerary. For twenty dollars or less, you can have an afternoon of fun that will be hard to match anywhere else. Funspot has so many 8-bit arcade games, that the best thing to do is to refer you to their website, so that you can read the list for yourself. Oh, and as a final note…Funspot founder Bob Lawton will be featured this Wednesday evening (January 9th) on American Restoration. Categories: 2600, 7800, Atari | Tags: 2600, 7800, arcade, Atari, Funspot, game, retro | Permalink. 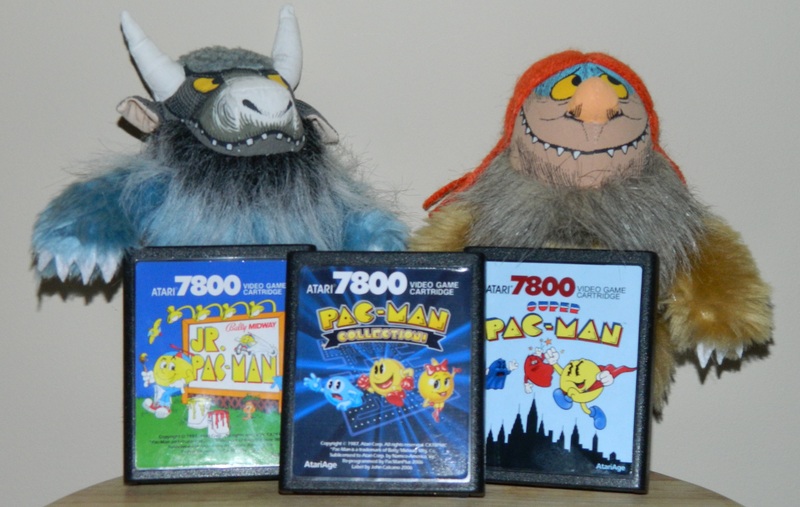 The only officially released Pac-Man game for the 7800 was Ms. Pac-Man, but thanks to Curt Vendel and Bob DeCrescenzo, we now have a complete library of Pac-Man games for the Atari 7800. Programmed by General Computer Corporation as part of the first set of games for the 7800’s release in 1984, Ms. Pac-Man is an excellent conversion. Ms. Pac-Man demonstrates the strength of the 7800 as one of the best home consoles for arcade ports. This game has great graphics and pretty much has it all…title screen, intermissions, four different mazes, and four flicker free pesky ghosts! Better yet, since millions of copies of this game were produced, a boxed copy can be had for less than ten dollars. The only thing that should stop you from picking up a copy for your collection is whether or not you decide to purchase the Pac-Man Collection described next. Bob’s collection is about as arcade perfect as can be done on a home system. He even ‘tweaked’ the already pretty awesome Ms. Pac-Man to be even better. The Pac-Man Collection has been one of the best selling carts at AtariAge since Bob put it together. If you have a 7800 you need to have this cart in your collection…don’t hesitate any longer! After he released his Pac-Man Collection, Bob turned his attention to creating a version of Super Pac-Man for the 7800. Before I started this thread on Pac-Man games, I really didn’t know much about Super Pac-Man and I don’t remember ever playing it in an arcade. I didn’t know what to expect when I ordered my Super Pac-Man cart from AtariAge, but I have to say that I really like this game. As always, Bob took care to make as accurate a port as possible and his 7800 version is a blast to play. 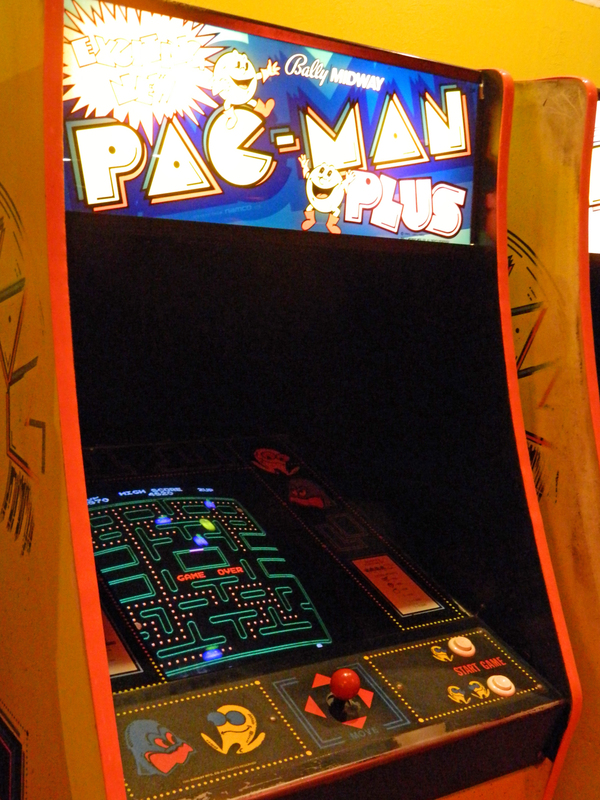 The colors are bright, all of the arcade features are included, and this game provides some variety from the ‘standard’ Pac-Man format. If you are a fan of Super Pac-Man, then this cart should be in your 7800 collection! This one started out as a fairly elaborate April fool’s joke on the AtariAge forum back in 2009. Bob DeCrescenzo had been working on Jr. Pac-Man and got a few friends to go along with the hoax that a prototype cart of Jr. Pac-Man had been discovered. The joke went pretty well until some discovered Bob’s initials in a line of code. Jr. Pac-Man for the 7800 is another Bob classic and has become my favorite Pac-Man game. Like the arcade (and unlike the 2600 version), the screen scrolls horizontally, there are six power pills, and the fruits have been changed. As the fruit bounces, it changes the dots into larger, more valuable dots, but can also destroy the power pills. Since this can be happening off-screen, there is some additional strategy to Jr. Pac-Man than other versions. Jr. Pac-Man is another awesome game and is available on cart from AtariAge. Thanks to GCC, Curt Vendel, AtariAge and, most importantly, Bob DeCrescenzo, almost every variation of Pac-Man is available to be played on the 7800. I asked Bob which version was his favorite…can you guess what he said? Considering that he goes by the handle ‘PacManPlus’, his answer should be easy to guess! Categories: 7800, Atari, Game Reviews | Tags: 7800, Atari, game, Pac-man, retro | Permalink.